There are several different options to consider when choosing the right replacement windows for your home. Having the proper replacement windows installed can increase your home’s comfort, beauty and value. Different materials offer unique benefits depending on what you are looking for. Choosing the best replacement windows doesn't have to be complicated - let us help! Marshall Exteriors offers products from the nation's leading window manufacturers and we provide the highest quality installations to ensure a perfect fit every time. Wood – Insulates well, provides natural beauty, regular maintenance required, however, they expand and contract due to certain weather conditions. People often choose wood windows because of their visual attributes. Vinyl – Replacement windows made from vinyl provide excellent insulation and are low maintenance, strong, and moisture resistant. Most vinyl windows are made of polyvinyl chloride with ultraviolet light stabilizers to prevent sunlight from breaking down material. Vinyl windows are also highly energy efficient, provide noise reduction, and are easily bent into shapes. Aluminum – Aluminum windows are maintenance-free and extremely durable yet light. While aluminum windows are known to conduct heat and transfer cold air easily, newer-style aluminum frames can have a “thermal break” inserted, which can reduce heat flow. Fiberglass – Fiberglass windows have insulating properties similar to wood and vinyl. With fiberglass replacement windows, there is moderate maintenance required, but they are also durable and can be painted to match indoor décor. We also offer different styles of windows that are sure to add curb appeal and functionality to your home. Often times, old windows lose many of their functional properties, such as keeping your home well insulated. They can begin to get stuck and not be able to open or close. Choosing the right kind of window for your home is based on certain properties, which our technicians can guide you through. Marshall Exteriors installs a variety of styles of replacement windows, including casement, double-hung, picture and more. Not all windows are created equal. While the window style may look the same from company to company, the glass and materials used can differ. Make sure you are getting only the best! Low-E glass - Low-emissive, or Low-E window glass is manufactured with an invisible metal or metallic oxide coating to create a surface that reflects heat, while allowing light to pass through. Low-E windows are proven to increase energy efficiency, decrease fading of fabrics, and increase the overall comfort in your home. Argon-filled glass - Argon is a non-toxic, odorless gas that is used in glass windows to prevent condensation and frost from forming on the window and provide improved soundproofing. Argon gas is filled between the panes of glass in a sealed unit to increase energy efficiency. 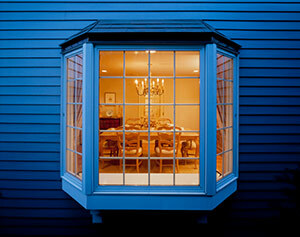 U-value measures how well the window protects against heat loss. Solar heat gain coefficient (SHGC) measures how much heat from the sun is allowed to enter through the glass. Visible transmittance measures how much visible light can pass through the glass. For U-value and SHGC, the lower the number, the better the window's energy performance. If you know you want to replace your old windows, but aren't sure where to start, we can help! We can provide suggestions on the right wood, fiberglass, aluminum or vinyl windows to fit your style and budget. Contact us today to schedule an in-home design consultation and Free Estimate! Our window replacement coverage area includes Geneva, Fairport, Newark, Canandaigua, Victor, Ontario, Seneca Falls, Waterloo, Farmington, Macedon and many surrounding areas of New York.